Summer is coming! That means another BBQ season has officially started. It’s a great time to gather with friends and family in your backyard, enjoy a piece of grilled meat, grab a glass of beer and relax in the cool summer night. While it’s great to grill delicious food on the bbq stove, one of the annoying things is the food always gets stuck on the grill and it ends up with dirty charred grates. Most people would use cooking sprays to oil the grill again and again to prevent this problem. But if you don’t want to use these unhealthy or messy oil sprays, there is a more natural way to do that. 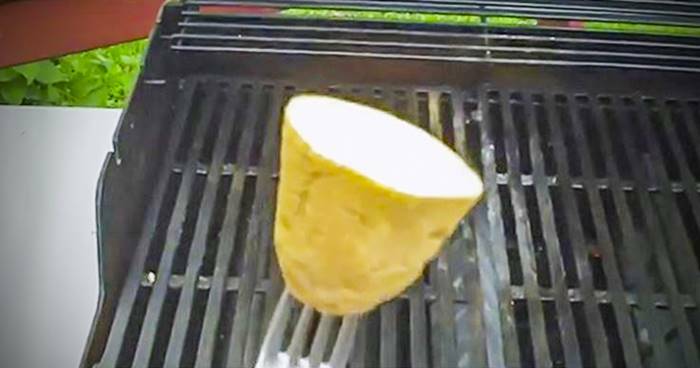 In this tutorial, YouTube user JohnsonInc999 is going to show us how to make a non-stick surface on your BBQ grill using a potato. Just cut the potato in half, stab it with a fork and then rub the potato back and forth over the grill when it is heated. It’s so easy and really works! This tip will definitely make your grilling experience much more easier and enjoyable! Follow the video and watch instructions and amazing result. Enjoy! Are you going to give it a try? Please share this useful BBQ tip with your friends and family!